I think this place has GNR potential. Just opened, I went last Saturday, still had the congratulatory flower baskets in the entrance. The food is Manchurian/Northeastern Chinese, definitely not for effete HK types. Our kind serveuse warned us that the service would have issues on a busy Friday night esp. w/r/t pacing of dishes but my table had a lot of catching up to do over a bottle of port - which went quite well with the food. It is BYOB for now. I say to the real LTH/LSC type folks here: Go here, go now, not all at once. Thanks for finding a new place for us to try! I'm just curious, after reading a bit on wikipedia, did the lamb with cumin also have caraway? That spice combination sounds very interesting. 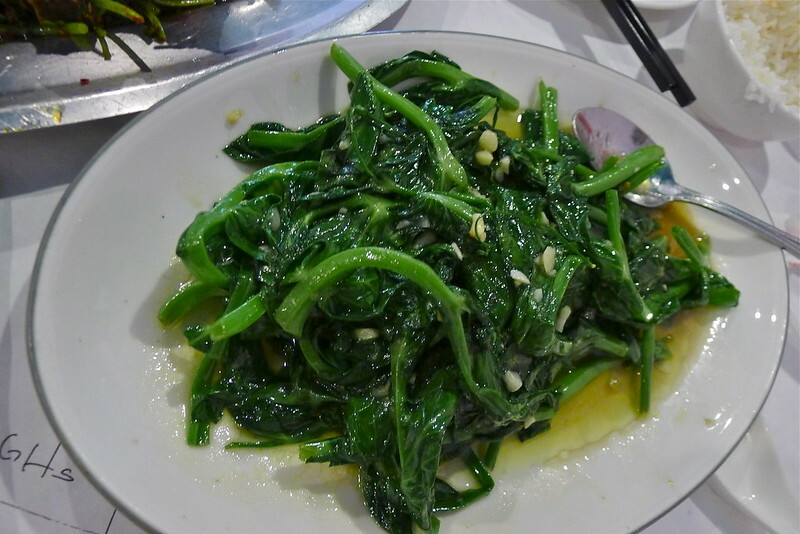 I'm also interested in the cuisine's heavy use of suan cai, and wondering if you noticed any of those dishes on the menu. I was pretty stoked when I drove by this place last week. 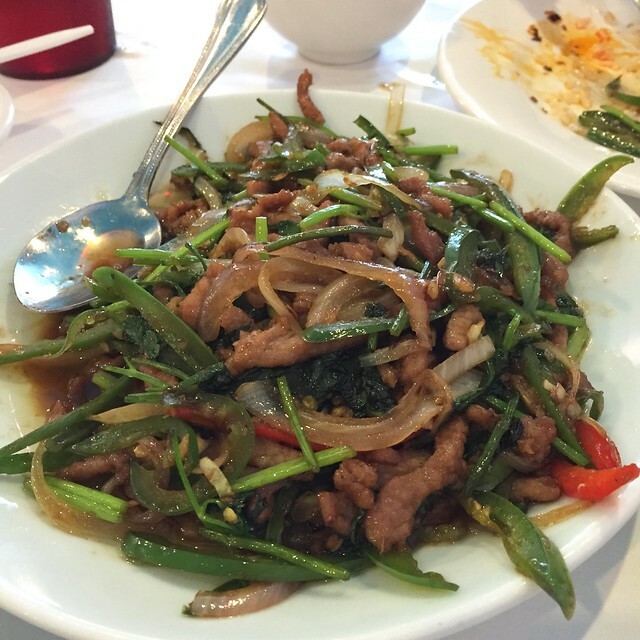 My experience with the cuisines of the northern provinces is limited to Ed's, Katy's, and Lao Beijing and a couple of spots out of town in LA, NY and Toronto. I've never really tried Manchurian or Korean Chinese cuisines, so I had hopes that the indeterminately named "Northern City" might expand these horizons. I wish that I had consulted this conversation I had on the LA thread before I picked up a menu over the weekend and gave it a once over. Its a characteristically sprawling affair with plenty of Ameri-Chinese offerings. The hot and cold appetizers sections seemed to have more specific descriptors (than the rest of the menu) such as "Northern" and "Korean" with an emphasis on pancakes and dumplings on the former and salads (many with cucumber) on the latter. 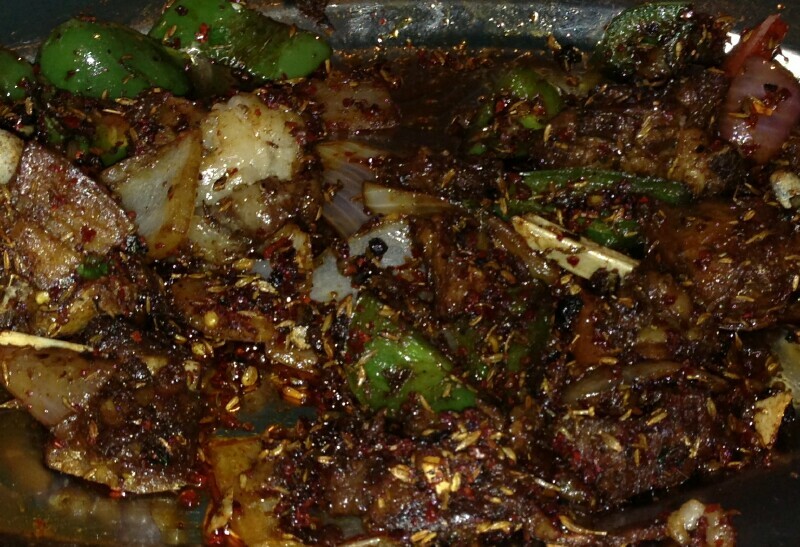 Another stand out aspect to the menu is a variety of lamb dishes, several with cumin. The casseroles section looks interesting as well. I stopped back in later in the weekend to carry out a few things that had stood out on the menu as well as a few items that seemed analogous to some favorites from Ed's. 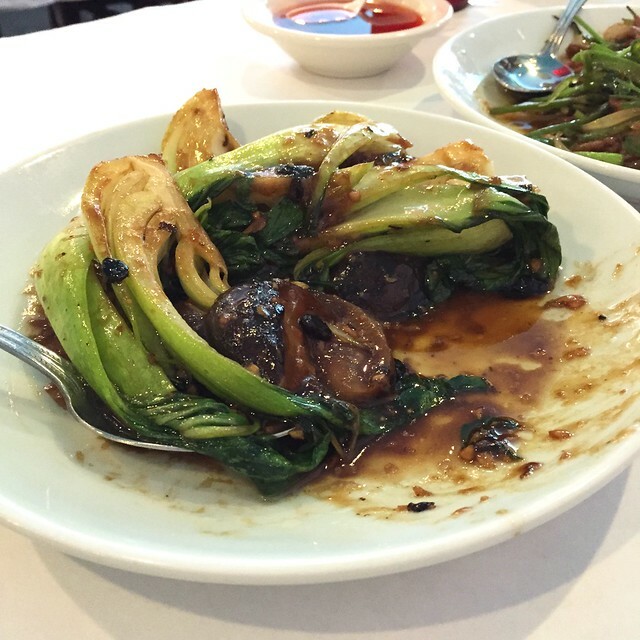 The more familiar dishes fared better. The Smoked Pork Pancake, for instance, was pleasantly chewy and flaky at the same time, with requisite scallion and hoisin. The pork was lightly smoky and tender, a nice rendition. I love the shredded al dente potato dishes at Ed's and NC's Shredded Potato w Chile had the right vegetal crunch, lightly dressed profile, and mellow chile burn from sliced jalapeños. Shredded Chinese Cabbage Salad was pretty good, if an overly substantial portion for an appetizer (huge). It was dressed in a chile and raw garlic spiked vinegar and came on a bed of tofu noodles. These were low rent hotdogs scored up to look fancy and seasoned very much like a lamb with cumin dish, heavily with cumin seeds, garlic, and sliced jalapeño. Not a bad dish, good seasoning, but a quirky surprise and not something I would really want to eat more than a few bites of. This seemed promising at first (despite that grey- ringed hb egg). Kimchi, pressed mystery meat, and a gochujang-like chile paste in a composed dish with noodles and shredded cucumber. Well, the meat, kimchi, and chile paste provided some decent bites, but the noodles- I swear it was cold spaghetti all clumped together, pretty much useless. And worth noting and most likely lost in translation in the take-out context, our order contained a quart of a cold mysterious sweet and sour liquid, thin with a broth-like consistency, but without the savory depth of a stock. I assumed it was meant to be eaten with the noodle dish, perhaps as a cold soup? I was hesitant to post about this meal, as the restaurant has only been open less than a week and carrying the food out removed us from the complete dining experience. But I must admit, I am going to wait until some one else takes one for the team and explores their menu as the kitchen gets its legs (or not). regional Chinese Restaurant such as this? Northern City will not win any Interior Design Magazine write-ups, nor will it appear in upcoming issues of C.S. Interiors. are the "highlights" of the decoration. But- the exhaustive menu will give the adventurous something to try for several visits. The servers are very friendly, and when they are challenged with English questions they cannot answer will bring another server to the table to help explain and guide you through the menu. The Menu is broken into Appetizers- Cold Appetizers- Soup- Fried Rice & Noodles - Seafood - Beef and Lamb -Chicken and Duck- Pork - Vegetables -Chef's Specials - Casserole- and the ever famous "Lunch Specials"($4.95- $5.95 ) and Desserts! We started with the Smoked Pork and Scallion Pancake (# 111). Lighter than a traditional "Tung-Yo-Pen"/Scallion Pancake I've had before on the streets in NYC's Chinatown, these were very fully stuffed w/ a "lechon-like" smoked pork. Quite Good. Cut into 4 quarters, served in a basket- no dipping sauce. 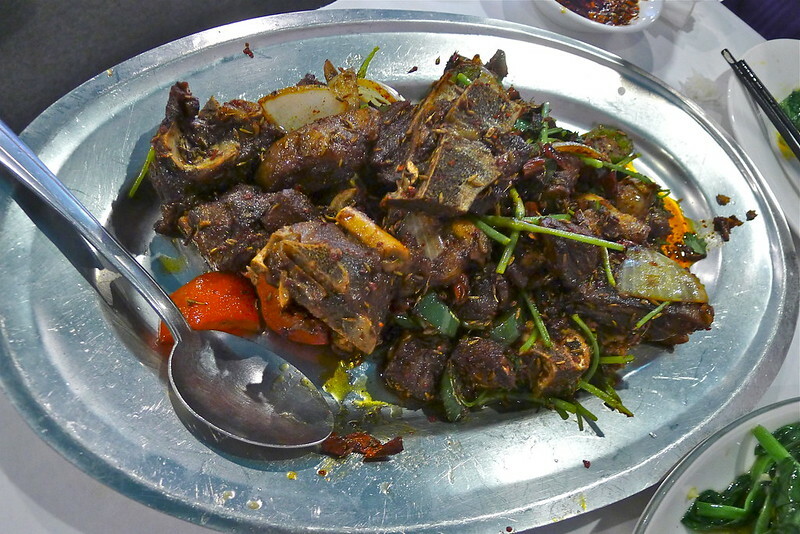 We also ordered the Lamb on Bone with Cumin (#601)- a HUGE platter, enough to serve 4- with a darkly cooked lamb, fattier than Lao Sze Chuan's version- but much more protein- and much drier than Tony's version. Not as "cuminy"- and not as spicy- but really, really good. I reccd trying this one- especially with the bones as I believe it adds more flavor. 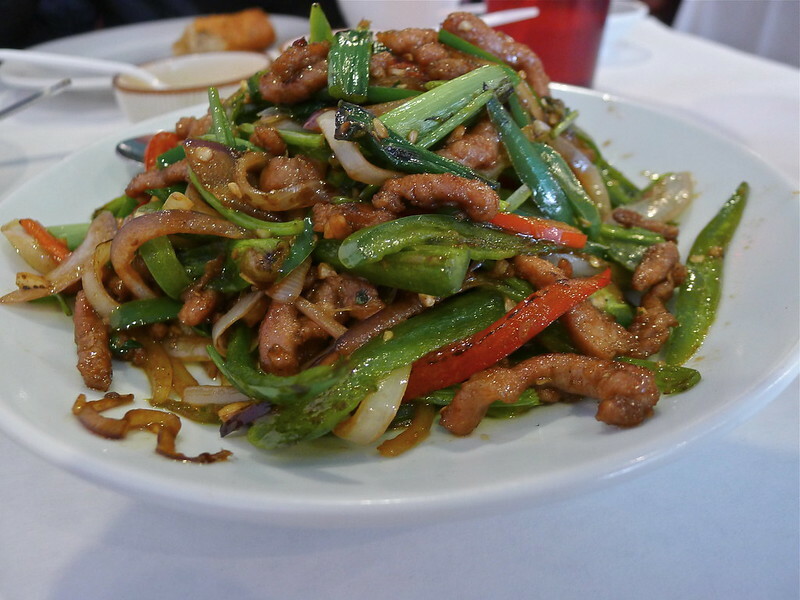 We also had a house made noodle dish w/ ground pork and shredded green bean (#421) (they called them "grown bean" ) that required a bit of table-side mixing- no problem- but once the flavors were blended made for a toothsome dish. The noodles were the diameter of spaghetti and had a great taste and texture. if you're a egg roll and shrimp fried rice eater- they have that too. The restaurants was only a quarter filled when we were there late on a Sunday Afternoon- but the clientele were mostly Asian. AND- since they were just opening- a 15% discount was added (subtracted) from our bill. NOT be in Chinatown proper,maybe it's easier to stand out from the crowd on 31st Street @ Emerald. Or maybe they wanted to blend into the rapidly expanding northern-Chinese restaurant row, as that part of Bridgeport is becoming known. 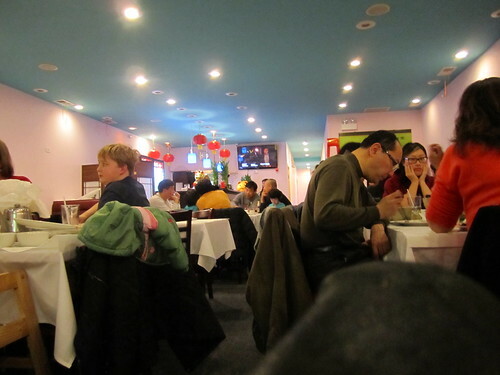 A block south on Halsted is another Dongbei restaurant, Homestyle Taste (which should have its own thread). And don't forget the venerable Potsticker House right between the two. This seemed promising at first (despite that grey- ringed hb egg). Kimchi, pressed mystery meat, and a gochujang-like chile paste in a composed dish with noodles and shredded cucumber. 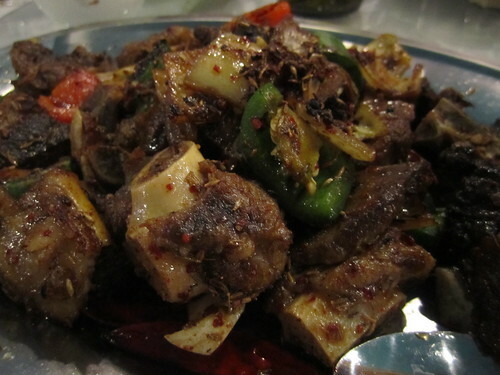 Hombre de Acero wrote: We also ordered the Lamb on Bone with Cumin (#601)- a HUGE platter, enough to serve 4- with a darkly cooked lamb, fattier than Lao Sze Chuan's version- but much more protein- and much drier than Tony's version. Not as "cuminy"- and not as spicy- but really, really good. Lamb on bone with cumin is, as HdA says, really good, crisp meaty with pockets of fatty lamb goodness and a deceptively large portion. While the lamb on bone with cumin is the dish I'm thinking about days later, house stir fry noodle and celery dumplings are going in regular rotation. 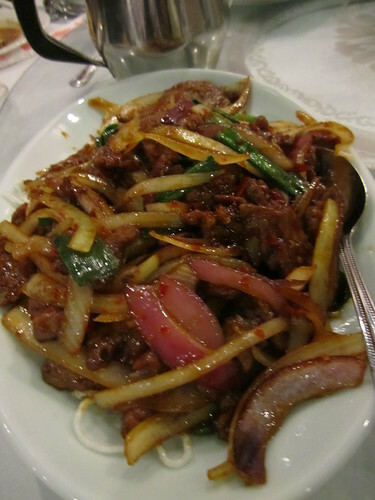 Sliced Beef tendon was evocative of Lao Szechuan's beef and maw Szechuan style, but did not pack quite the punch. Reasonable prices, they are still giving 15% opening discount, interesting menu, good service, comfortable setting. I am looking forward to return visits. Planning to go tonight with 8-10 people. For those who have been, will it be challenging to get a table around 6PM? I went with the OP at about six thirty and we sat right away, party of four. The big rounds were mostly full, IIRC, so being prompt or sending an advance party might be wise. mtgl wrote: I went with the OP at about six thirty and we sat right away, party of four. The big rounds were mostly full, IIRC, so being prompt or sending an advance party might be wise. I'm glad they have big tables. Thanks. I took the extraordinarily bold step of calling for rez -- for a table of eight, they took us. Nice. 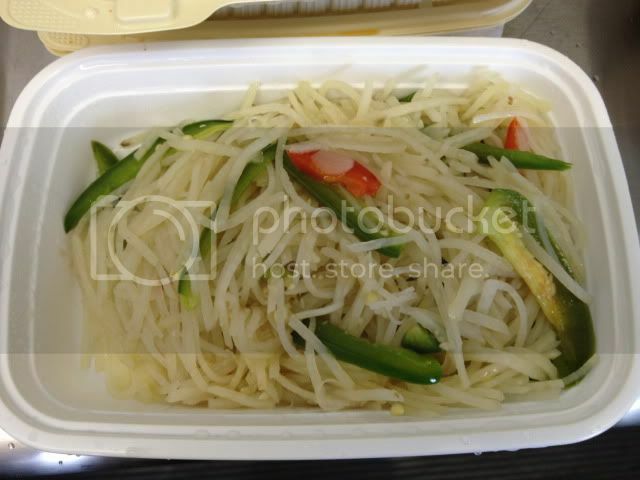 I was in the mood for Chinese, but, lacking a takeout menu, I had to compose our order via pictures on LTH. 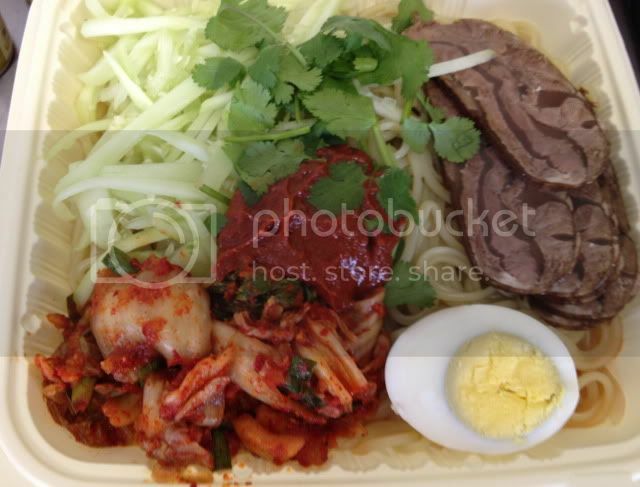 I asked for the Korean cold noodle as mentioned above, but received...the Northern Style cold noodle. Same mysterious meat, same too-salty egg, same strange cold liquid. Very sad. It wasn't good. Luckily, the celery dumplings and the orange chicken my husband always orders were good. I had barely an idea of what to expect at Northern City. I’d read the comments above, and based on those (and with all the talk of takeout, and Great Danton's initial warning to not go "all at once") I wasn’t even 100% certain they had many actual seats – you know, places to sit -- in this place. I was wondering if it was little more than a takeout joint. It is a lot more than a takeout joint; I’m guessing it has capacity for a hundred or so. Arriving with six other friends on a Saturday night, I was glad to see a lot of big tables in a big well-lit room (the better to shoot photos by). The menu is huge, as it is at so many Chinese places. I think that’s maybe because there are many interchangeable components across multiple dishes. 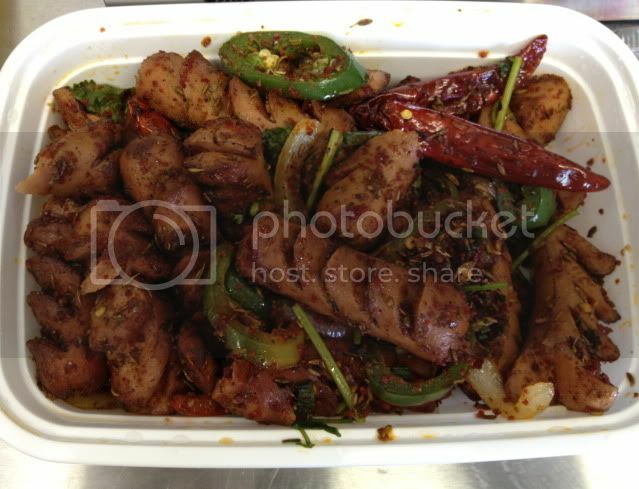 The chopped sweet peppers can be used in probably several dozen different dishes, same with onion and other ingredients. The beef that’s used in one entrée can be precooked and, with a few additional spices, be rendered suitable for inclusion in any one of a number of beef dishes. 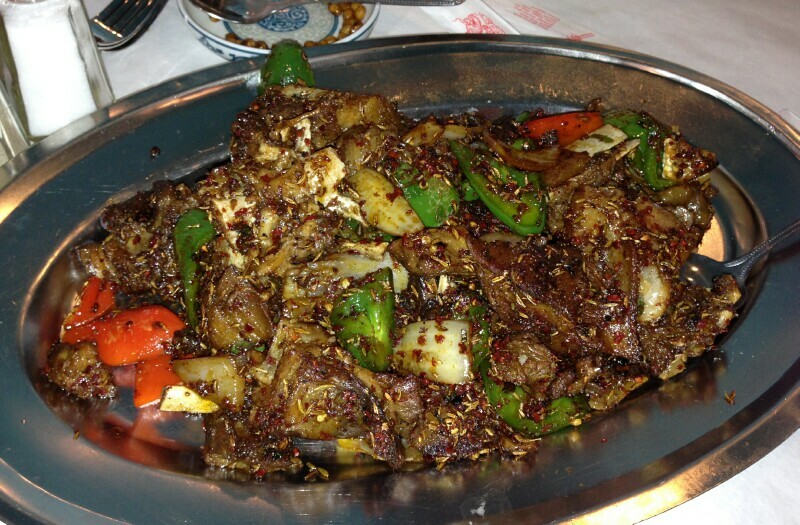 We ordered some Mongolian beef, for instance, that seemed to have spices added in just before (as I here speculate) the generic one-size-fits-all beef was quickly warmed up prior to serving; the spices kind of “sat on top” of the meat. Overall I thought the dish – which seemed to arrive moments after ordering – a disappointment. Maybe that should have come as no surprise. 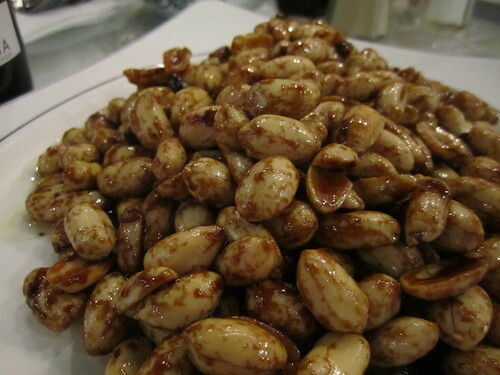 Ditto the vinegar peanuts, which sounded so cool but which turned out to be what seemed merely Planter’s goobers with some soy and vinegar. Cool concept, but I’d like try making my own with fresh green peanuts. 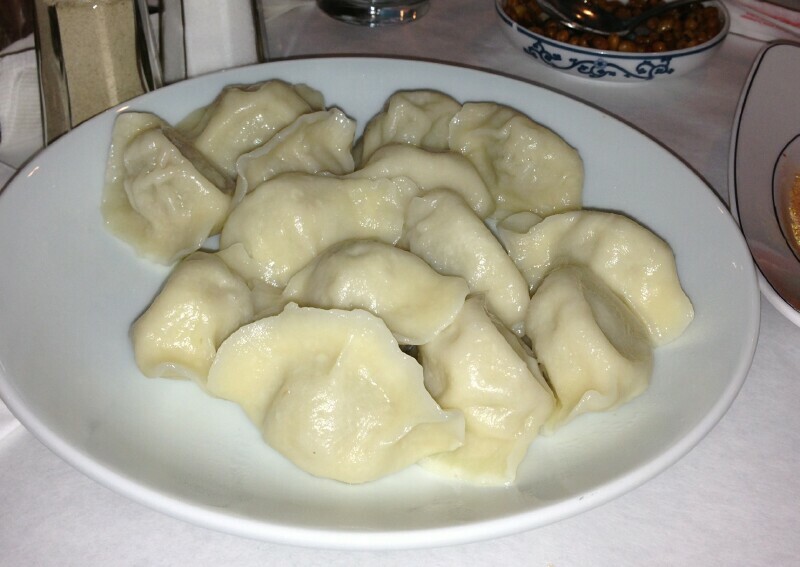 So far, I’m flat lining, and that lack of upward spikes continued through the pot stickers and dumplings. Ho hum. 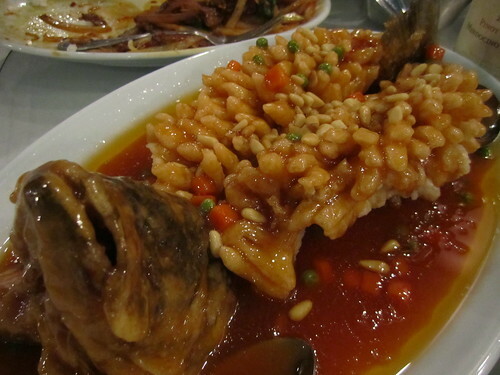 We ordered a whole fish in sweet and sour sauce that we really liked. The interior of the fish had been cut into little posts, dipped in what I believe to have been rice flour, and quickly fried. The result was a kind of fried forest of little fish posts, really good. This technique maximizes surface area of the fish flesh and so you get a lot of crispy crevasses and crannies. I’m no fan of sweet and sour, but on this dish, I enjoyed even that unsubtle sauce – though next time I may ask them to hold the sauce and then add the provided chili oil, which was just fine (not GWiv-level, but fully acceptable). This fish also looks pretty amazing on the table. When the Lamb Sautéed with Cumin with Bone came to the table, I got real happy, as did everyone else. As suggested, getting the bone-in meat seemed like it would ensure additional fatty flavor, and it certainly did. The slight nuttiness of the spice was a beautiful enhancement to the lush meat, nubby with fat pockets and eminently suckable bones. 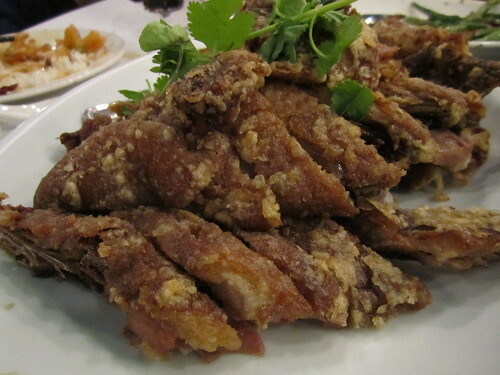 Crispy duck was very good, with deep flavor and very crispy skin (after roasting, the quacker seemed to have spent a few seconds in deep fat, frying away and crisping up). 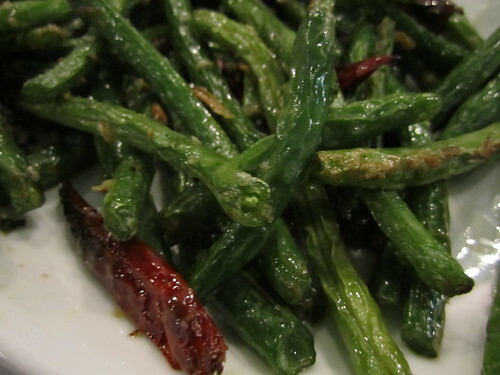 As we’d had a rather meat-heavy dinner, I’m glad one of our group ordered the stir-fired green beans, which were a pleasant contrast. After after all that animal protein, we needed veg and these were excellent. We ordered a little more than we could eat, and for seven people, the bill came to a little under $100, which is pretty incredible. As Northern City is also BYOB, it’s a high-value experience…and well worth the trip. I'd imagine they offer another sauce for the whole fish, or @ the very least, will do something on request. Will try and report back. The presentation is fairly common, looks great and is done for the reason you stated. I do my mangoes that way. The celery dumplings are good but a top note @ best. I believe mainly pork w/the addition of celery leaf. Nothing that special. The flavor was very much in the background. 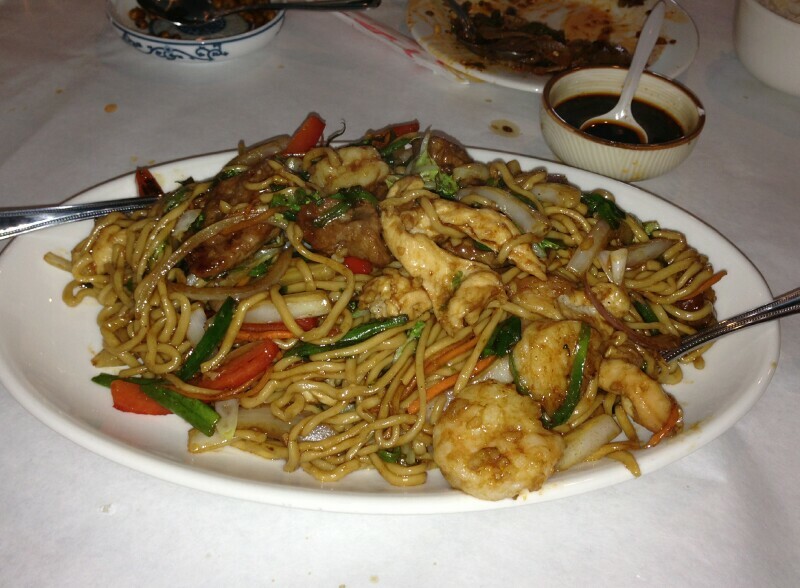 One thing I enjoyed besides the lamb were the fried noodles. I believe they were Shanghai style but pretty devoid of curry. The texture was excellent though. We asked if they were made in house and they said yes, but you never know w/the language barrier. We've been to Northern City a few times -usually just the two of us - and rarely stray from the lamb with cumin (we got the "sausage" once before reading above and were disappointed that it was hot dogs). To counteract the fatty lusciousness of the lamb we have settled on the Chinese Cabbage salad which is a tangy pile of shredded Napa on top of cellophane noodles. This dish is almost Thai/Vietnamese tasting with a lot of acid, sweetness and a little spice. We've also tried egg drop soup which was decent, but nothing mind blowing. Last time we had a dining companion and were able to expand our selections a bit. We added on the Spicy Beef Belly Noodle soup and Salt&Pepper Shrimp. The soup was phenomenal with a rich beefy broth and chunks of fatty beef (belly? I'm not sure b/c I've never had it. The meat had some exterior fat, the texture was similar to a pot roast or short rib.). The broth was spicy and the noodles were perfectly chewy. The head-on shrimp in the S&P were well fried and flavorful, but the dish lacked any acid or spice to cut through the fry. Overall we've been really happy with Northern City (it's our go to with Spring World gone) and we've definitely got our favorites which we may expand on, but would be fine if we didn't. this dish never disappoints us!- and often inspires other tables to order-by-pointing-well-have-THAT! Pea Pod Shoots- a very satisfying and savory "green" high in minerals and a great offset to the Lamb. for a tasty New Year treat! can be quite challenging to maneuver. 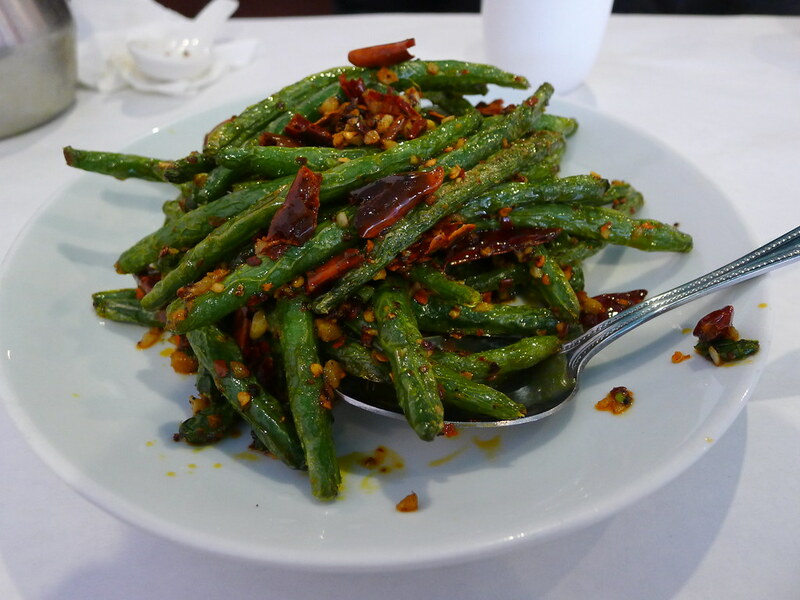 I just love the things these high octane chinese restaurant woks do with string beans. Looks killer. we ordered our food - during a "slow-er"
the entrées were served- in what seemed like 5 minutes! (they ARE cookin' w/ gas here!) ..
Mon.through Friday, from 11am to 3pm?